It’s Friday the 13th and the newest recurrence of this infamously superstition-driven day has fallen so serendipitously within the month of October and, only a handful of weeks off from Halloween. Seems more like a bit of unexpected good luck than bad, doesn’t it? Well, if nothing else, at least some good luck can be claimed on this day dedicated to unfortunate events, thanks to Bandcamp and the “new arrivals” discovery section. 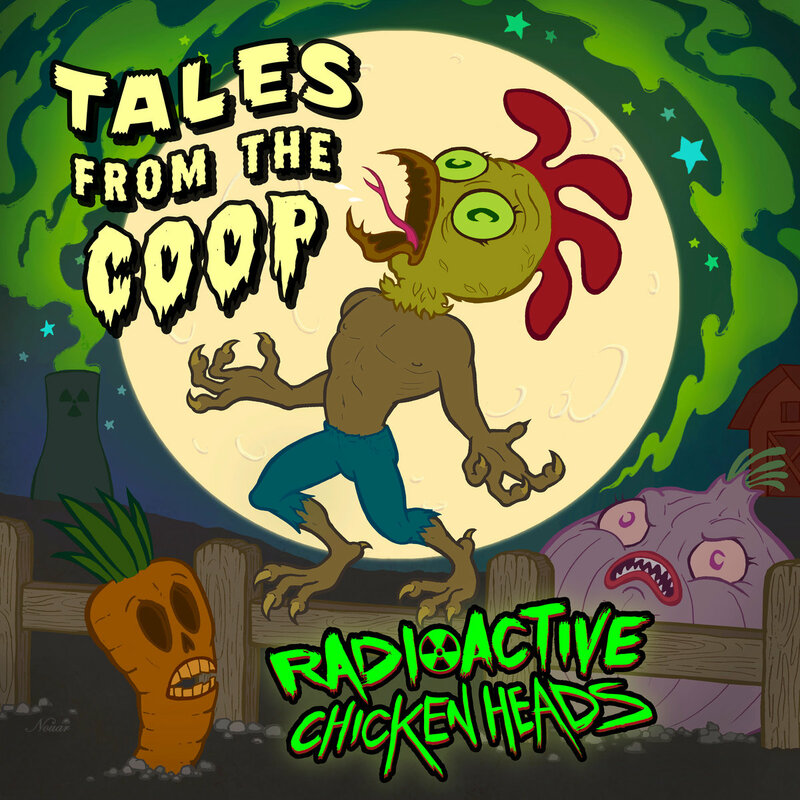 Released today with thematically perfect timing, is Tales from the Coop, by Radioactive Chicken Heads. If this sounds like a Friday the 13th musical prank, rest assured it isn’t. The Radioactive Chicken Heads are a real band, from Santa Ana, California, that not only has several albums, music videos, and an independently developed video game in its arsenal but was even on national television back in 2006 – on the Tyra Banks Show. Fast forward 11 years and this ragtag band of punky poultry and vegetables is as theatrical and enjoyably entertaining as ever. Despite being so overtly comedic in its appearances, lyrics, and overall stage personality, this mega group – whose names include the likes of Carrot Top, Punky Rooster, and El Pollo Diablo – isn’t something just to be written off. Sure, listeners are pretty much guaranteed releases that are loaded with bird puns, and music that’s full of upbeat, classic punk structural repetition. However, underneath the showmanship, the Radioactive Chicken Heads are legitimately solid, clear, and consistent in their ability to play, record, and present well made work with care. (The delicate but prominently placed glockenspiel in the album’s title track being paired with low noted “ohhs” feels like something straight out of a Cloud Caverns track and definitely isn’t an instrument turned to in times of uncreative laziness) While the flash might be initially deemed an easy distraction from presumed lower quality musicianship, these folk are no slouch players and Tales from the Coop is one of the strongest displays of this goofy but committed ethos. A 13 track album released on Friday the 13th, Tales from the Coop goes to the nines on delivering a concept album that connects with both the band’s Chicken fueled identity and the spookiness of today’s superstitions. Everything from the band’s heads to the album’s zany but well drawn “Night of the Living Dead-esque” artwork is working in sync. Not to mention that this will undoubtedly carry over with ease into Halloween. Hosting track titles like “Wiccan Chicken,” “Poultrygeist,” and “Killer Klownfish,” (great hat trick wordplay for that last one, to creepy things, Halloween, and the recent surge of killer clowns thanks to Stephen King’s IT.) The titles are just the tip of the silly songwriting iceberg. Musically, Radioactive Chicken Heads mirror a punk rock that is more “approachable Ramones” than Bad Religion. It’s upbeat like punk but melodically singable and generally absurd like Reel Big Fish circa We Hate It When Our Friends Become Successful (BMG Japan, 2005). The vocal style on many of the tracks is either exaggerated sing-speaking delivered in lower registers, peppy group female vocals, or features shouted group vocals that call to mind the aforementioned ska band or certain more goofy chapters of The Offspring’s catalog (see also, Conspiracy of One or Americana). Though elaborated adorned with giant character heads, the band isn’t one specifically aimed at children either, like the currently popular Finnish metal band, Hevisaurus. Nevertheless, there are plenty of laughs to be had, as the lyrics and wordplay are too funny not to pass up. “Frankenchicken,” for example, which unfolds the basic story of Frankenstein with a fowl in place of its main character, ends up a hilarious figure not just for his mutant bird status but also for the fourth wall break at the end of the song, where the repetition of his name gets on his nerves. The thematic nature of Tales from the Coop is simultaneously the record’s greatest asset and biggest weakness. It’s not too likely this album holds up well at parties outside of days like Friday the 13th and Halloween but for the occasions where its humorously creepy duality fits, this album makes for a great surprise addition to party playlists. It’s polished enough to sound super mainstream but off the radar enough to fill heads with curiosity and intrigue when hearing the name Radioactive Chicken Heads turns out to be a first. Tales from the Coop albums and merch packages are available now on Bandcamp.